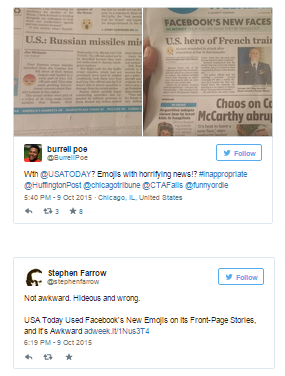 Facebook's New 'Reactions' Are Already Being Misused! Weeks back, everyone was talking about Facebook creating a dislike button – this news was as a misinterpretation of Mark Zuckerberg’s statement on creating new buttons on Facebook to show feelings asides the Like button. On October 8, Facebook, through its product manager Chris Tosswill, announced that they had began testing new buttons called Facebook reactions in Spain and Ireland. Today we are beginning to test Reactions – an extension of the Like button that gives people more ways to share their reaction to a post in a quick and easy way. We’re excited to start this test, but understand that this is a big change, and one that we want to make sure to get right. So we’re starting by offering Reactions to Ireland and Spain, where people will be able to react to any post across Facebook – a post from a friend, advertiser, publisher or business. 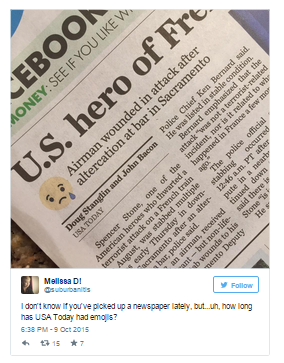 However, a popular print newspaper, USA Today, probably in an attempt to incorporate online trends into its print newspaper has begun inserting Facebook’s new reactions into its headlines. You would think that this will make its readers happy and proud, instead it has done the opposite. Was this a desperate move by the newspaper to save its declining readership? Is this a sign that Facebook users might use the reactions wrongly? Zuckerberg and his team may need to publish a ‘how to use Facebook Reactions’ article to help the situation… or maybe not.